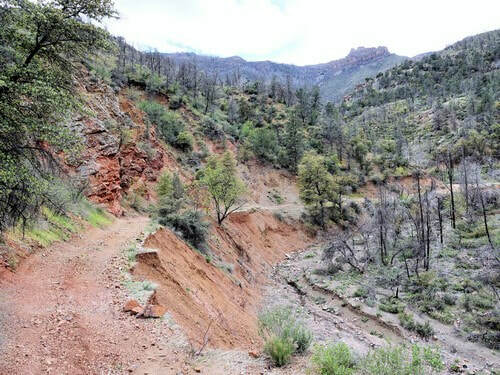 This is a beautiful Jeep trail that starts out in the heat of the desert near Globe and ends in the cool Ponderosa pines at 6,000' south of Young. 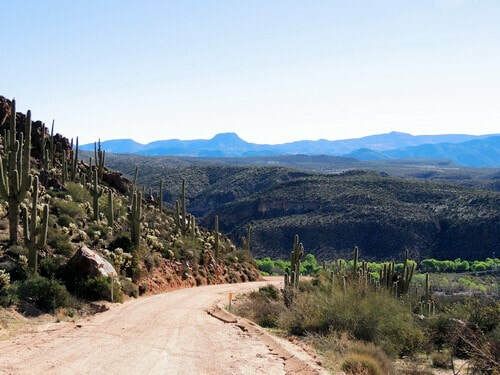 You will pass by rugged mountain ridges, interesting rock formations and distant Indian cliff dwellings. The trail is rated a weak 2.5. I put it up to 2.5 because of the risk of future rains causing more erosion on the side drainages, or at the Gold Creek washout described later down the page. 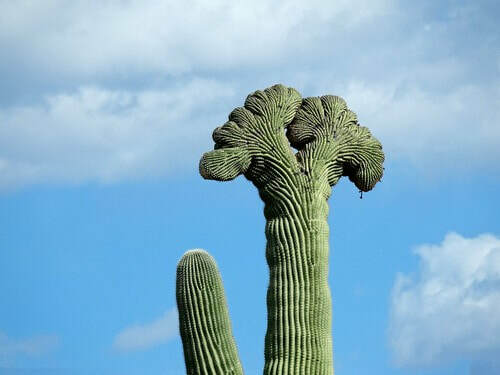 Look for a rare double crested saguaro on SR 288 just north of the intersection with Cherry Creek Road. The southern 19 miles of the road is wide, smooth and easy. We stopped to air down just off the pavement. Not really needed for this section, but the north section is rough and bumpy. Road grading stops at the last private house. The road beyond here does not appear to get any maintenance. After this point the trail quickly climbs up on the slope above Cherry Creek and stays there the entire way. The road crosses many tributary drainages as it cuts along the steep slope. These crossings erode more with every rain and will certainly get worse over time. Although the southern part is scenic, the northern ungraded part is more so. 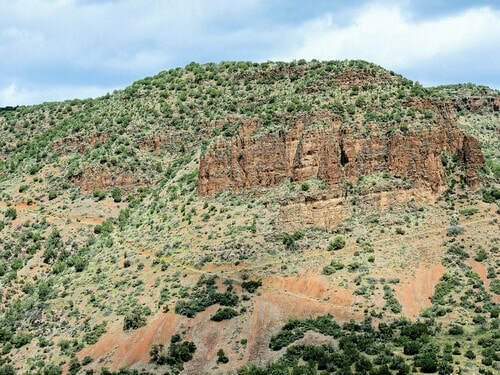 Rugged country with high mountains and deep canyons. 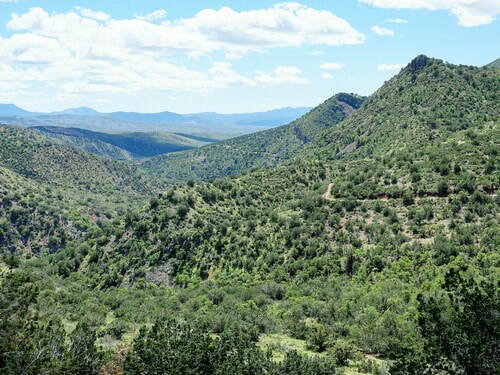 Ancient cliff dwellings are located in rugged canyons along this road, mostly within the Sierra Ancha Wilderness. They were built between 1280 and 1350 by indians known presently as the "Salado". Why they chose to utilize this challenging environmental zone is not yet fully understood. 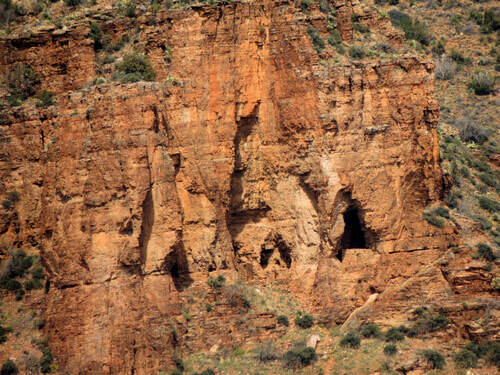 ​Keep a sharp eye out and bring along binoculars or a strong telephoto to see the dwellings. They will be across the creek on the east side of the road. 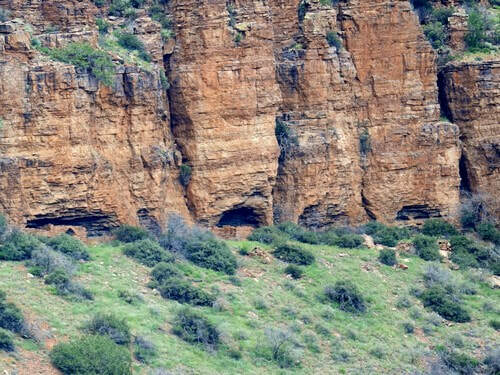 We were able to pick out cliff dwellings in two locations along the trail. There are many more not visible from the road. 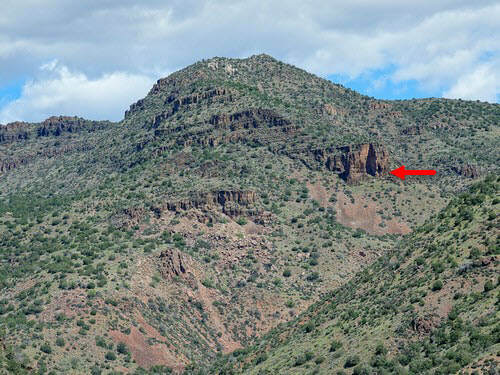 It is about 3 miles between view spots. This area has a history of uranium and asbestos mining, as attested to by abandoned mining roads across Cherry Creek. 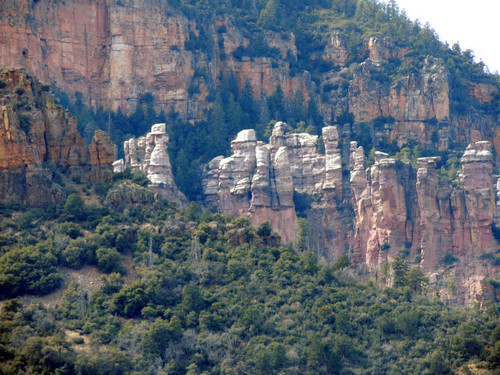 ​There is a rock formation near the north end we like to call "Ghost Hoodoos of the Sierra Ancha". 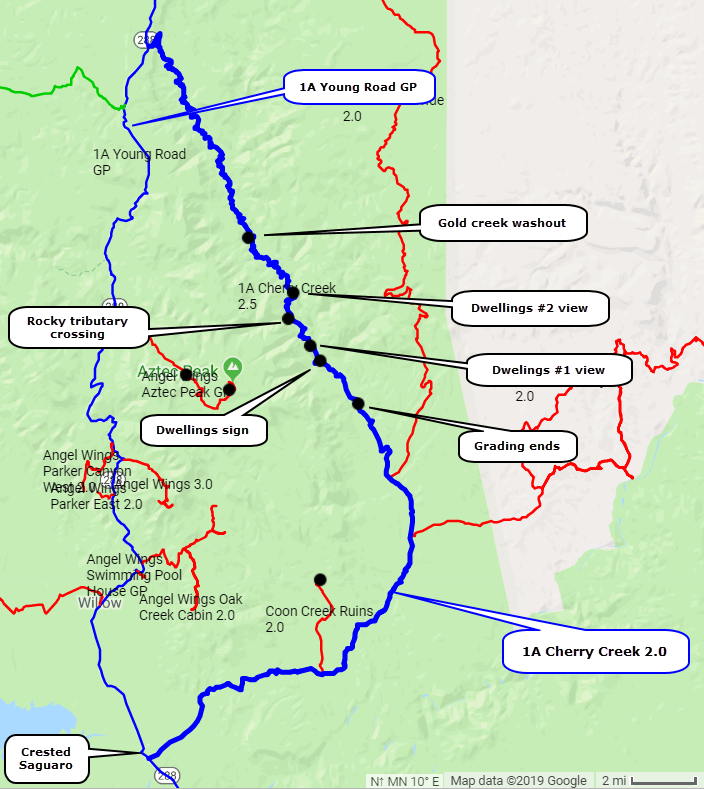 The Juniper fire of 2016 burned the northern third of the trail, including Gold Creek drainage, and caused heavy rainfall runoff. 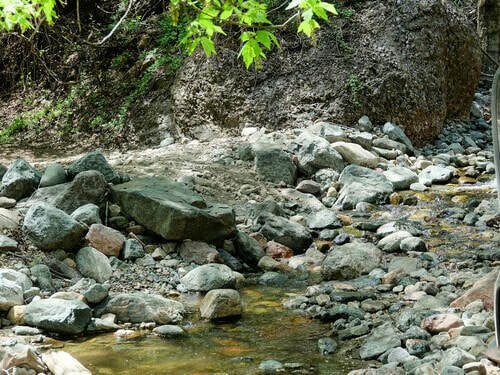 Gold Creek washout is the biggest concern for the future of this trail. The photo shows the road being undercut by Gold Creek. 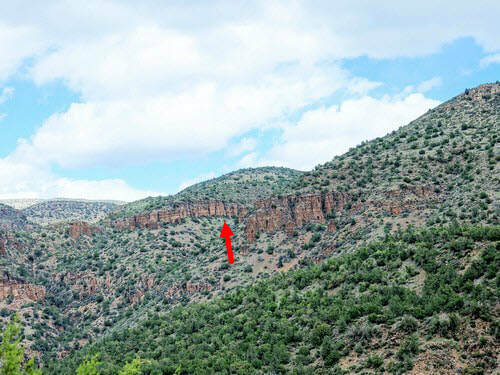 Additional undercutting at the ledge will make the trail impassable. The road has already been obliterated where it actually crossed Gold Creek just beyond the photo, and it was rerouted down into and then back out of the creek below the obliteration. The washout is the last item of significance. The trail is smoother but quite mundane beyond this until it rises up to the Young Road and offers a nice view back down Cherry Creek. If you want to do the entire trail you might consider starting on the north end. If Gold Creek has destroyed the road it is a short, fairly smooth trip back to the Young Road. 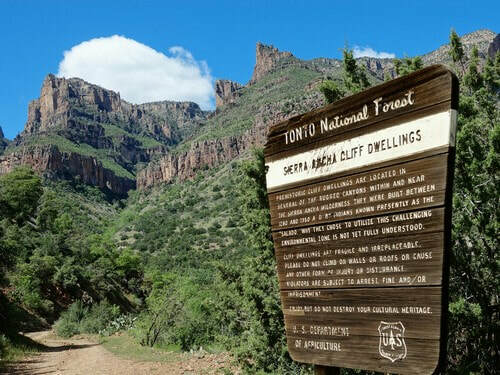 If you are only interested in the cliff dwellings you might only travel to viewpoint number 2 from the south and then return the way you came in. Updated in spring of 2019. Please contact me if you run this in the fall of 2019 or later. I will post your update here.